This software lets you convert a DVD to your phone and watch it in great quality in full screen landscape mode. A memorycard as small as 128 Mb is sufficient to store a full length feature film. You can watch your DVDs on the go, on any Nokia Series 60-phone, from a postage stamp size memory card. Never a dull moment with your DVD's in your pocket. Take blockbuster movies with you while you travel, or keep the kids busy in the car. The software installs an encoding package on your Windows XP computer, you insert a DVD in the drive and with only two clicks, the software turns it into a super small movie file, which will play on a special mediaplayer on the phone. The headset or the built-in speaker can be used to listen to the sound. Subtitled and foreign language DVDs are also supported. Feature films look crisp and sharp on the phone and still fit on a relatively small multimedia card. 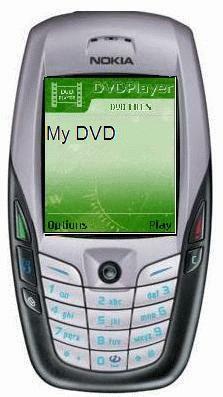 This is the only direct DVD-to-Nokia software available. Other programs are not so smart as they sound, they require you to use difficult DVD rippers, convert to intermediate files and then again to the phone, taking many hours of time. Not this one. The free tryout version allows users to convert 5 minutes of a DVD. Important: This software may only be used to convert personally owned DVDs. Makayama Software supports Fair Use.